As part of the Sports Unit's strategy to develop teams that are able to excel in both local and international competitions, The UWI, Mona grants scholarships of tuition and/or accommodation to qualified athletes. In addition to a full training programme athletes will also benefit from a meal plan which should ensure that their nutritional needs are better managed. Scholarships valued at three millions dollars ($3m) were granted to eleven (11) football and eight (8) track and field athletes for the 2008-2009 academic year. 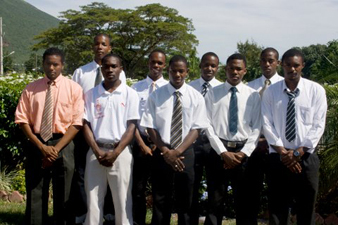 This was the first time UWI offered scholarships. Nine of those athletes were new students who were chosen through a rigorous selection process which involved collaboration with coaches from various high schools. This was done to ensure that the student athletes selected have a passion for sports coupled with academic aptitude. The UWI Mona is now accepting applications for scholarships from eligible students. Download the Application Form - Word Document or PDF Document. Be able to meet the university’s matriculation requirements. Display good conduct and deportment, and be in good academic standing. Have demonstrated significant sporting potential or have competed in national or international competitions. Be able to meet the athletic qualification standards set by the university.